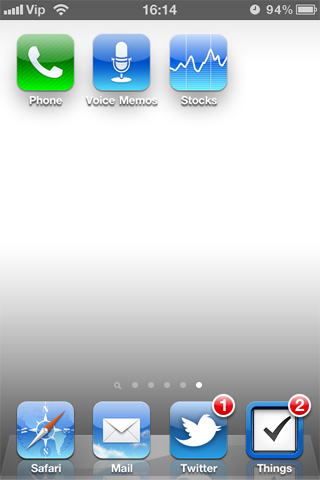 I recently had white iPhone in my hands and just for test I wanted to put white background on Homescreen. Just to see how would an all-white device look like. Check this out, this is a screenshot (reduced to 50% pixel size) of pure white wallpaper set as background. This is not so visible when you are using your everyday wallpaper as it is most likely dark, but even in those dark wallpapers (unless they are completely black) you can notice these additions. Try scrolling between screens slowly and you will see the blurry big shadow behind each icon move. And this pretty visible bottom gradient becomes more obvious now that you know it is there. It is pretty neat that Apple tries to increase visibility and architecture of interface as much as possible no matter what wallpaper you use. The icons will always stand out, and the bottom row will always be emphasized. Here is the full list of images that interface overlays on elements. Found it here. WallpaperGradientLandscapeBottom – The shadows at the side of the wallpaper. WallpaperGradientLandscapeTop – The shadows at the side of the wallpaper. WallpaperGradientPortraitBottom – The shadows at the side of the wallpaper. WallpaperGradientPortraitTop – The shadows at the side of the wallpaper. FolderShadowTop.png – The shadow present at the top of the folder. SBBadgeBGMask.png – When you open a app, the notification is pushed. spotlight-full.png – The shadow that appears whenever a notification is received. spotlight-keyboard.png – Similar to spotlight-full, but happens when you use the keyboard. That is just scary. The amount of graphics which you do not even notice, but they are here to make sure everything is neat-o. I must confess I kind-a expected this kind of perfectionism from Apple. A lot of stuff, I as a user don’t even have to know about (and don’t), that makes the whole experience as smooth and natural as possible.